The common problem right after every project brief back in my studying days are where should I begin? or at times after the design was created - how could I explain it? What are the basis for this design?. Over the years, I've discovered several approaches to design. Here are the breakdown summary in each of these approaches *(You could view it in a slide format available here). An overall breakdown for each category of approach. *Applications may vary. 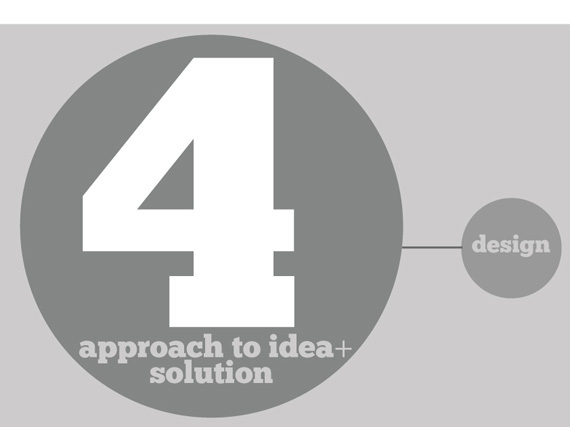 - the method and the 'ideation' (how to generate it into a design). *(Also included are level of difficulties). This method is called 'Concept'. It is commonly used throughout the design world. Titles of concepts tends to lean towards a usage of a certain 'unique keywords' (or as I called a 'Bombastic Keywords') an attempt to make it more appealing for the impression that it consisted a certain uniqueness either in it's design and approach. 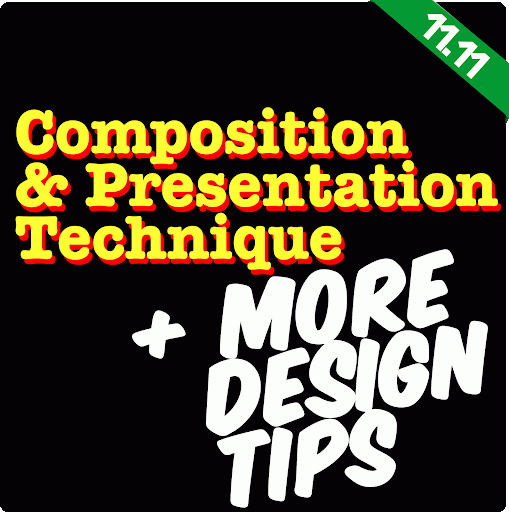 This approach is a natural steps in the journey of designing and understanding design for beginners. However, it could also be misused as a shortcut for design with less depth into it. For example, after a brief visit to the site, I've overheard an information that the site are constantly flooded by rainfall. 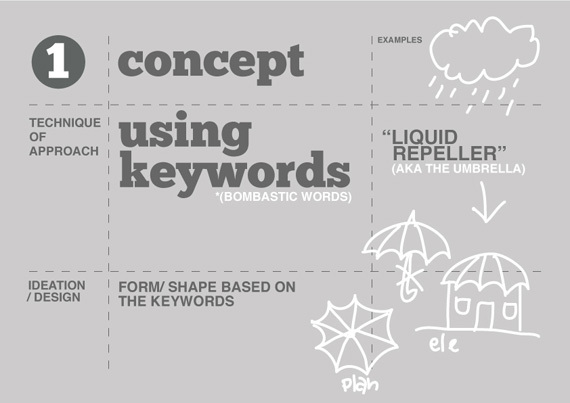 Literally, I began to associate these factors keyword site = (flood + rain) therefore design will be rain = umbrella, to make it more design-ish, I'll name it, 'The Liquid Repellent'. I'll then jumped right away into form. I took away the umbrella leg, using the shape of the umbrella from above as my plan and pop in the umbrella as my main form just to 'stay in concept'. However, here is where the problem comes in. I didn't venture further in to find out what is causing the flood. No matter how much the liquid is repelled from the building, the flooding will continue. The designed building is neither solving the flood problem or considering the flood as an influencing factor to the building (for example building it on a stilts). I've also began to cramp in all the spaces in my building for the sake of the umbrella shape. This is what we called, function (spaces) follow form. Sometimes it works, most of the time we end up with unused negative spaces. If we began to address the flooding or any other problems in the proposed site and to resolved it through design - this method is called an 'issue based' approach. Issue based could also be not just from the site but also from the problem with the current design or any other matter faced by users. The lack of access to the disable for example, or the lack of communal spaces, etc. The attempt to improved the current condition or to resolved this issues with design is the core for the issue based approach. To achieve the solution, we could began by comparing current ideas and solutions from other designs. This is known as 'precedent studies'. 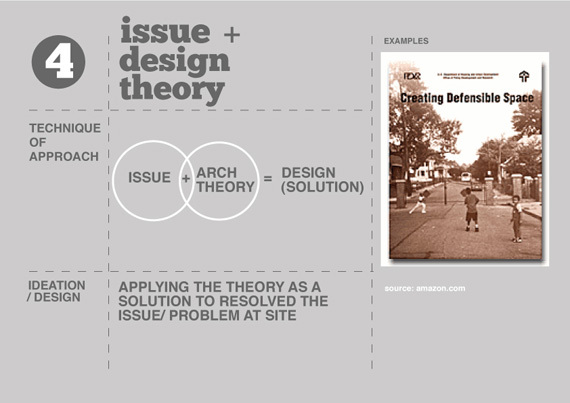 A combination of issue, precedent studies and idea in an attempt to resolved this issues will be the design. The name of this attempt will also be the title keyword of the design. Perhaps it might take more than several words, this is where choosing a holistic keyword to represents it really comes in handy during presentation. 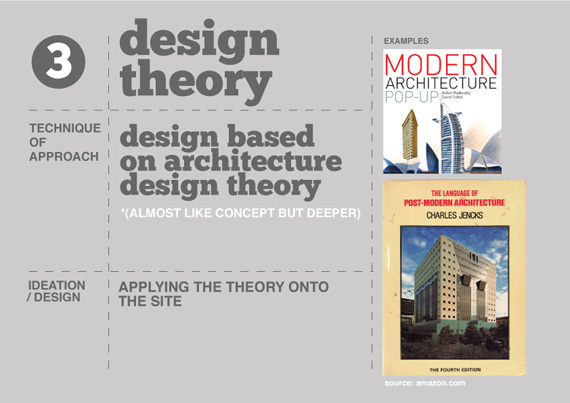 Design Theory approach is based on an architects design philosophies and views towards the design. In this approach, we are not addressing the raising issues in the proposed site, but perhaps it is more towards answering the project brief and requirement. This approach seems similar to 'Concept Approach', however it is complex and requires a deeper and thorough studies and understanding. 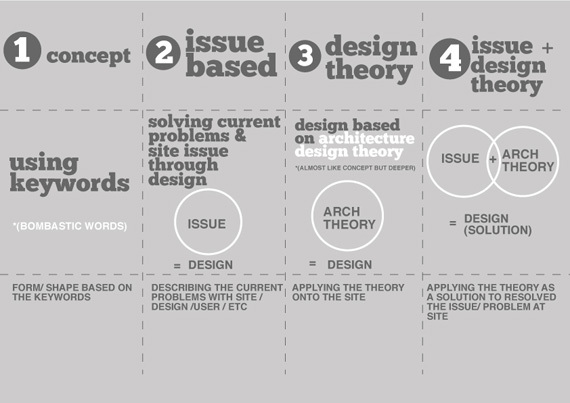 Consider yourself as a disciple to these philosophies because we are borrowing their theories in our path towards the design solution. Without it (an in-depth understanding where we will be constantly challenged in our attempt towards the design solution), the produced design will be considered as a poor & vague imitation attempt towards the design solution. The fourth is a combination of approach no.2 and 3. 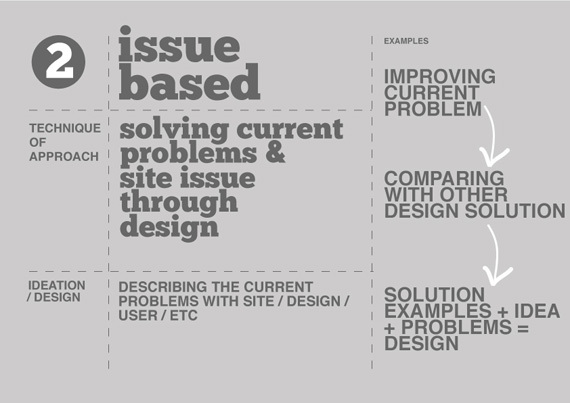 It is an attempt to solved site issues with design theory to produce a solution through our design. Such solution could be a combination of several other theories that you feel relevant and necessary in order to resolved several raising matters regarding the site, building or space and to follow through all these theory as a problem solving guideline through the design. To conclude, whichever approach that we took, based it on the most important aspect of design: Problem solving. Architectural design is a concept that focuses on the components or elements of a structure or system and unifies them into a coherent and functional whole, according to a particular approach in achieving the objective/s under the given constraints or limitations.